The autopsy is in full chunter. “Why didn’t we do this?”; “Why didn’t we do that?”; “Why didn’t he play this guy with that guy?”. It’s always the same after a Ryder Cup defeat. There’s no hiding from it: 17-11 is a proper hiding. It is, in fact, the heaviest defeat inflicted on Europe since 1981 and a half-point worse than the one handed out to Sir Nick Faldo’s side in 2008. That, perhaps, is the most damning indictment of how badly this year’s match went for the men from this side of the Atlantic. No wonder Darren Clarke withdrew from this week’s Alfred Dunhill Links. “There’s the guy that was a worse captain than Faldo.” That’s what folk would say. He wasn’t, of course. Not by a long shot. Faldo’s ill-fated reign plumbed depths that even Jacques Cousteau couldn’t have fathomed. Clarke, by comparison, was far more measured, far more professional – but 17-11 is still 17-11.
Credit should be given to the Americans long before fingers are pointed at Clarke. That’s not to absolve him completely from blame. He got a lot of things wrong and, to me, it looked like he panicked after the 4-0 whitewash on the opening morning. He seemed like a man in ‘damage limitation’ mode from that point on. Also, picking Lee Westwood and Martin Kaymer backfired spectacularly. Indeed, for future reference, let the record show that 'form' is more valuable than 'experience'. Still, hindsight is 20/20, isn’t it? The USA winning this Ryder Cup isn't the worst thing that could have happened. Even so, this was a Ryder Cup that the US won more than Europe lost. The ‘Task Force’ came good; the players looked hungry, more determined and, crucially, more unified; Davis Love III managed not to get in his own way, à la 2012; and, most important of all, the putts dropped when they needed to. More often than not, the sum of those parts adds up to victory, and so it proved again this year. 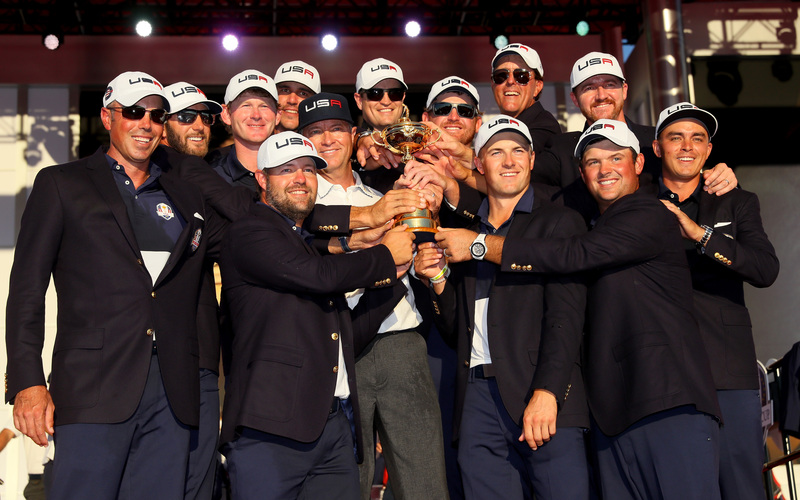 Let’s be honest: the USA winning this Ryder Cup isn’t the worst thing that could have happened. Like Lee Westwood acknowledged, where could the US have gone if they’d lost for the fourth time on the spin and having gone to so much work to get it right this time? No, this a good thing. Even though losing stinks, it's absolutely a good thing. The trick now, from a European point of view, is to make sure that losing doesn’t become a habit. The team needs to be competitive in Paris in 2018 – and that means making a few tweaks. I can already hear the usual suspects clearing their throats to scream ‘KNEEJERK REACTION’. “The current system has worked fine up until now,” they’ll bleat. “Why change it after one defeat?” Simple: because, in it's current form, this system is no longer fit for purpose. I've got a laptop that's ten-years-old. Mechanically, it still 'works' but that doesn't mean it's the best thing for me and my job. In any case, I’m not about to advocate wholesale changes. This is evolution, not revolution. The first change? Look at adjustments to the qualification structure to ensure that we field the strongest team possible. That’s maybe slightly idealistic because of the European Tour’s self-serving agenda. As the administrative body for the match on this side of the Atlantic – ironic, given that it stages more events outside Europe than in it, but there you go – the tour uses qualification for the Ryder Cup to protect its own interests. In other words, you must be a member of the tour and play a minimum number of events in order to be eligible. That wasn't the best European team we put out last week - and that's not right. That’s never going to change completely. The Ryder Cup is bigger than the European Tour, and the tour knows it. However, there’s something fundamentally wrong with the system when two of the world’s top 20 golfers – Paul Casey, above, and Russell Knox – are sitting at home as the match unfolds. People will say, ‘Well, if the Ryder Cup matters that much to them, they’ll do what the European Tour asks’. I get that. I just fundamentally disagree. The match is ‘Europe versus the USA’; not ‘the European Tour versus the USA’. The balance has tipped too much to the latter. A weaker product (the European Tour) is wielding influence over a stronger product (the Ryder Cup). It's as backward as it gets. Secondly, we need to make sure we pick the right man to captain the side in Paris. The bookmakers have Thomas Bjorn, above, as the frontrunner and I can see why. He’s popular with the players and is a long-standing, loyal servant to the European Tour. It’s ‘his turn’. But that, to me, is no grounds for giving somebody the job. We shouldn’t be giving away the captaincy just so that somebody gets to have their lap of honour. It should go to the best man for the job, not the next man for the job. For me, that leaves one obvious candidate: Paul McGinley. Who cares that he ‘had his go’ at Gleneagles? Why should that preclude him from getting another shot? Just because that's ‘not the way we do things now’? Give. Me. Strength. He took the job seriously and did it well. Why wouldn’t we want to at least offer him the chance to do it again? Because he has nothing to prove? Fine - but let him say that, not us. Some will say this would be a ‘step backwards’. I couldn’t disagree more. Two things: one, sometimes you have to go backwards to go forwards; two, does the defeat at Hazeltine not already count as a ‘step backwards’? There’s much to be considered, lessons to be learned, and much to get right next time. Tiger Woods is expected to make his first PGA Tour start in over a year at next week’s Safeway Open (formerly the Frys.Com Open). I’m just going to come right out and say it: he’ll finish in the top ten. This week, I have been… Saddened to learn that Glenisla Golf Course is closing its doors. The extent of the comments on our Facebook page say more than I ever could about how popular it has been since it opened in 1995. As much as anything else, it is another victim of the over-supply of golf courses in Scotland. There simply isn’t enough demand to justify the number we have, which, sadly, is why I fully expect more to shut before things start to plateau. It’s a regrettably necessary evil. Thomas Pieters, Europe’s undisputed star man at the Ryder Cup, drove the green on the seventh at Carnoustie during the first round of the Alfred Dunhill Links Championship. It measures 407 yards. Still standing by that ‘driving distances aren’t increasing’ B.S.? I’m looking at you, Mike Davis, and you, Martin Slumbers. And finally… Greg Norman published a pretty detailed checklist for how to prepare for 'Hurricane Matthew'. I'm not sure what I love more: the fact that ‘chill a few beers’ is there or that it's already checked off. What a guy! Log-on every Friday morning to read The Cut Line, a weekly blog by bunkered's Michael McEwan.